Aim: This study aims to assess the attitude, awareness, and knowledge of the dental professionals regarding dental lasers in India. Materials and Methods: This survey was conducted at the 69th Indian Dental Conference, 2016, after approval from the organizing committee. Three-hundred copies of the questionnaire were distributed among the practitioners attending the conference. The questionnaire consisted of 23 questions. The first part of the questionnaire was about dental laser education and the second part was about the knowledge of dental laser applications. The second part was divided into six subsections. Each section consisted of several items related to the uses of laser in five different dental specialties in addition to a section on laser protection. Results: Only 21% of the respondents had received any formal training before the use of lasers. Most of the participants had insufficient knowledge regarding the applications of laser in dentistry. Students' knowledge of the uses of dental laser in periodontics, oral surgery, and operative dentistry was better than their knowledge in pediatric dentistry, orthodontic, and endodontics. Conclusion: The results of this survey suggest that there is a need to educate and train dental professionals regarding dental lasers to utilize this new technology to its full potential in future. The word LASER is an abbreviated term for light amplification by stimulated emission of radiation. It was first developed by Theodore Maiman in 1960. After successful usage of lasers in medical field, lasers were tried for its possible applications in dentistry also. Co2 lasers were first to be approved by the Food and Drug Administration for intraoral use. However, laser dentistry began to gain popularity only in 1990. Since then, lasers have been used in all the disciplines of dentistry for the management of soft and hard tissues either as an adjunct to conventional technique or as a primary tool. On the basis of its clinical applications, lasers can broadly be divided into two categories: soft-tissue and hard-tissue lasers. Soft-tissue lasers mainly comprise Co2, diode, and neodymium lasers; employed chiefly in gingival and periodontal tissue management. Erbium hard-tissue lasers have a major role in apicectomy, surgeries, and operative dentistry. With the evolution of lasers, the standard of dental care has been raised tremendously. Nonetheless, before successful integration of lasers into dental office, it is important to have thorough knowledge of several aspects of lasers such as – laser physics, various delivery systems, different wavelengths available and range of application of each wavelength, accurate clinical technique, laser safety, possible adverse effects, and sterilization and disinfection protocol. In the coming years, paradigm shift is expected to occur in dentistry because of advances in laser dentistry. For this to happen, adequate training of clinicians is of utmost importance. Al-Jobair et al. conducted a survey to assess the level of dental laser education among undergraduate students of Saudi Arabia in 2014. Despite a tremendous increase in laser usage, no such survey has been conducted in India. Hence, this survey was carried out among undergraduate and postgraduate students studying all across India to assess their awareness, mindset, and knowledge regarding various applications of lasers. Information obtained from this survey might help in evaluating if more stress needs to be given on training of the students in future. After approval from the organizing committee, 200 copies of the questionnaire were distributed at the 69th Indian Dental Conference 2016 held at New Delhi, among the dental professionals from various parts of the country. The survey included both under and postgraduate students. The questionnaire comprised three parts: Part I (question 1–6) comprised of questions regarding personal details of the respondents such as age, gender, and qualification; Part II (question 7–22) question assessed the level of knowledge and extent of training of respondents regarding dental laser; and Part III (question 23) assessed the awareness and understanding of respondents regarding applications of lasers in different specialties of dentistry. The score given to each question ranged from +2 to -2. hence for total 34 questions the overall score ranged from +64 to -64. Overall, score of each student was divided by the total number of items to obtain mean score. The same formula was used separately for each specialty (operative dentistry, endodontics, periodontics, pedodontics/orthodontics, oral surgery, and laser protection) to obtain average score. The mean of the scores obtained in different specialties was calculated to judge the level of overall knowledge of the subject. 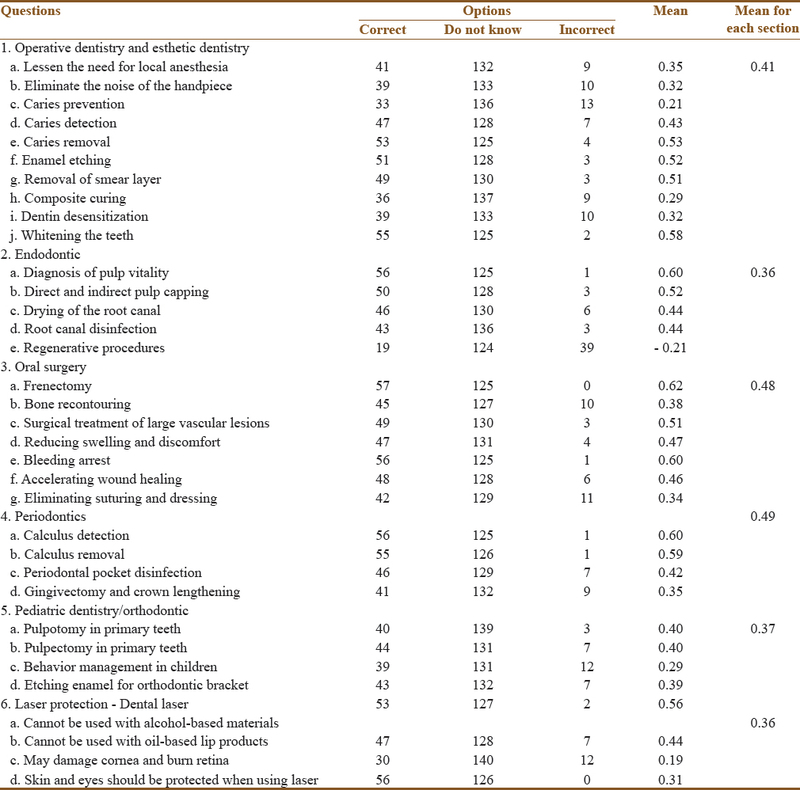 Knowledge regarding several application of lasers in various specialties of dentistry [Table 2]: Highest mean score was observed in periodontics (0.49) followed by oral surgery (0.48) and operative/esthetic dentistry (0.41). The lowest score was seen in endodontics (0.36) followed by laser safety and pedodontics/orthodontics (0.37). Among the various applications of lasers, participants were most educated about its utility in oral surgical procedures such as frenectomy and bleeding control, assessing pulp vitality, and calculus removal/detection. On the other hand, participants were not well-informed about the role of lasers in regenerative procedures and caries prevention. A written questionnaire-based survey was chosen for the study as it is cost-effective, reduces bias and can be easily used for large sample sizes. The response rate of the survey was 60.67% which is considered good. Among the respondents, only 21.43% had used any laser equipment. The reason for this might be lack of training or availability due to high cost of the equipment. A survey conducted by the American Dental Academy in 2000 revealed that only 3.5% of dentists were using lasers in their private practice. They proposed that it might be because of their ability to get comparable outcome with conventional techniques. Diode laser was most often used among the practitioner because of the fact that diode laser is highly absorbed in pigmented tissues with minimal effect on adjacent dental hard tissues. It has been extensively used in various soft-tissue procedures such as gingivectomy or sulcular debridement resulting in its huge popularity among the dentists., Most of the practitioners reported that they had received only 1–8 h of laser education. This reflects insufficient laser education and lack of proper training. A good number of the respondents showed great interest in laser education; and implementation and integration of laser education with undergraduate course might help in increasing popularity and awareness about dental lasers. As most of the students rely on information and training provided during their undergraduate courses, the introduction of laser courses in undergraduate curriculum might increase the popularity of this relatively new technology. In this survey also, more than half of the respondents (60%) felt that special laser course should be introduced in dental undergraduate curriculum. Most of the practitioners reported that patients were highly satisfied with the treatment when lasers were used. In a survey conducted by Wigdor et al. to assess the patient's perception of lasers in dentistry, he concluded that the patient felt more comfortable when lasers were used instead of high-speed handpiece. Respondents had more laser education in periodontics, oral surgery, and operative dentistry. Consequently, they were more aware about applications of lasers in these fields. [Table 2] shows the mean score of the respondents regarding their knowledge of laser application different specialties of dentistry. The highest score was obtained in periodontics followed by oral surgery and operative dentistry. It can be attributed to the fact that initially lasers were mainly used for soft-tissue surgical procedures, thus leading to its greater popularity in periodontics and oral surgery. Later, lasers were extensively used in caries removal too making it popular in operative dentistry. However, the results of this survey show that lasers are still not being extensively used in pediatrics/orthodontics and endodontics. Participants were not familiar with several applications of lasers such as caries prevention, pulpotomy, and pulpectomy in pedodontics, and root canal disinfection. Most of them did not know about application of lasers in regenerative endodontics. Surprisingly, majority of the respondents were not aware regarding protection measures to be taken while using lasers such as use of laser safety glasses, face shields, and correct laser wavelength and power settings. For the safety of the clinician and patients, it is of paramount importance to educate practitioners of laser safety measures. Dental lasers were introduced to dentistry in the mid-1960s. However, still, lasers are not being used to their full potential. Results of this survey clearly indicate that dental practitioners and students are interested in using laser technology. Furthermore, growing number of patients seeks out for the clinics where laser dentistry is practiced. However, there is a need of proper training regarding both theoretical and practical aspects of lasers. Furthermore, implementation of laser education in undergraduate curriculum might provide a chance to gain knowledge and practice lasers at an early stage. This new technology, if used to its full potential, can revolutionize dentistry whether it is diagnosis, prevention, or treatment planning. Maiman T. Stimulated optical radiation in ruby. Nature 1960;187:493-4. Husein A. Applications of lasers in dentistry: A review. Arch Orofac Sci 2006;1:1-4. Garg N, Verma S, Chadha M, Rastogi P. Use of carbon dioxide laser in oral soft tissue procedures. Natl J Maxillofac Surg 2015;6:84-8. Myers TD, Sulewski JG. Evaluating dental lasers: What the clinician should know. Dent Clin North Am 2004;48:1127-44. Al-Jobair A. Dental laser education and knowledge among final year dental students at King Saud University in Riyadh, Saudi Arabia. Saudi J Dent Res 2014;5:98-103. Health Interview Surveys. Towards International Harmonization of Methods and Instruments. Copenhagen: WHO Regional Office for Europe; 1996. Bagheri A, Purkhamene S. General dentist's awareness of laser application in dentistry. Int J Cur Res Rev 2005;7:35-8. American Dental Association. The 2000 Survey of Dental Practice. Characteristics of Dentists in Private Practice and their Patients. Chicago: American Dental Association; 2002. Coluzzi DJ. Lasers and soft tissue curettage: An update. Compend Contin Educ Dent 2002;23:1104-11. Wigdor H. Patients' perception of lasers in dentistry. Lasers Surg Med 1997;20:47-50.